SCP-1843 and instances of SCP-1843-1 during testing in Foundation property. Special Containment Procedures: SCP-1843 is to be held in a Large Containment Vault in Storage Site-12’s Safe SCP Wing. Specimens of the genus Ovis are to be kept at a minimum distance of 2.5 kilometers from SCP-1843's containment. Specimens found within the 2 kilometers radius are to be moved at a minimum distance of 700 meters from SCP-1843’s range of effect or terminated, if necessary. Deceased instances of SCP-1843-2 are to be contained in separate cryogenic freezers after examination. 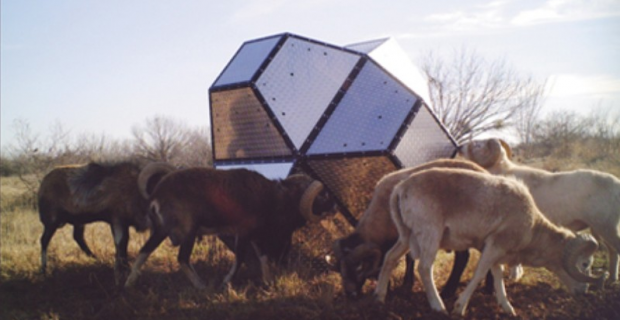 Controlled testing with specimens of the genus Ovis is to be done outside, and requires the approval of at least one (1) Level 4 personnel. Description: SCP-1843 is a polyhedron-shaped1 hollow structure of unknown, possibly extra-terrestrial origin. SCP-1843 is mostly composed of silicon, iron and polystyrene. SCP-1843 measures 1.50 meters in height and 1.50 meters in width, weighing approximately 500 kilograms when empty. SCP-1843 can be opened via a small metallic door found on one of its faces. SCP-1843's anomalous properties only affect specimens of the genus Ovis (referred as SCP-1843-1) present within a 2 kilometers radius. Instances of SCP-1843-1 will move towards SCP-1843 in groups of 5-10 individuals, mostly composed of adult males and female juveniles. Instances of SCP-1843-1 display more hostility than normal, but do not possess physical strength above normal specimens of the genus Ovis. Once the instances of SCP-1843-1 have reached SCP-1843, they will proceed to perform a "ritual", referred as SCP-1843-A event. SCP-1843-A events are usually of violent nature, consisting of the sacrificial murder of a female juvenile (referred as SCP-1843-2), performed by instances of SCP-1843-1 by crushing SCP-1843-2's skull with their hooves or by repeatedly hitting it with their horns. In rare occasions (<2%), instances of SCP-1843-1 have been observed to cannibalize instances of SCP-1843-2. The older instance of SCP-1843-1 will then proceed to place the remains of SCP-1843-2 within SCP-1843. After the SCP-1843-A event has ended, all the instances of SCP-1843-1 will bow their heads down to SCP-1843 and proceed to move away from it. Instances of SCP-1843-1 that participated the SCP-1843-A event lose all their anomalous behaviors once they are 500 meters distant from SCP-1843, despite still being in its range of effect. SCP-1843 was recovered the 2010/██/██ in █████, Germany, after the reports of a metallic object falling in the rural area of Germany. After 2 weeks of investigations, SCP-1843 was found in █████, being "worshipped" by several instances of SCP-1843-1, most being domestic sheep (Ovis aries) and wild mouflon (Ovis musimon). SCP-1843 contained fourteen (14) deceased juvenile specimens of Ovis aries and five (5) deceased juvenile specimens of Ovis musimon, currently contained among other instances of SCP-1843-2. Addendum 1843-1: Excerpt from Testing Log-1843-13-F.
Subject(s): Seven (7) specimens of Ovis aries; four (4) adult males and three (3) female juveniles, referred as SCP-1843-1-26 to -32. Procedure: All the instances are transported via vehicle to SCP-1843 to avoid hostile reactions. The instances approach SCP-1843 without accident. Results: SCP-1843-A event begins. The older specimens begin to "dance", moving in circle around SCP-1843, followed by the younger males. The female specimens emit an high pitched sound throughout the whole event. The dance finishes after 20 minutes and 15 seconds. The younger males (SCP-1843-1-28 and -29) force a juvenile (formerly SCP-1843-1-31; now SCP-1843-2) to lay in front of SCP-1843. The older specimen (SCP-1843-1-26) kills SCP-1843-2 by crushing its skull, and proceeds to place SCP-1843-2 within SCP-1843. At this point, SCP-1843-1-26 screams for 2 minutes, before all the specimens bow down to SCP-1843 and return to the containment vehicle. Analysis: Those “screams” have been recognized as an attempt of SCP-1843-1-26 to speak German. Those with Level 3 clearance may read Document 1843-12-AD for further information. Translator's note: The following is a rough attempt to decipher SCP-1843-1-26's vocalizations. However, since its speech mostly consisted of bleats and German gibberish, this translation is approximate. SCP-1843-1-26: We beg you to free us from the [unknown] that has tormented us since the first wool. SCP-1843-1-26: The [unknown] has forced us to live in fear. SCP-1843-1-26: [Unknown] has denied us of the warmth in the cold, and devoured us in the warm. SCP-1843-1-26: If you are our [helper (? ), savior (? )], accept this virgin as a treat, and destroy the [unknown]. Addendum 1843-3: Summary of Testing Log 1843-13-G.
On 2010/██/██, SCP-1843-1-26 was exposed a second time to SCP-1843, among other six (6) instances of SCP-1843-1. SCP-1843-1-26 did not participate to the SCP-1843-A event, but limited itself to repeatedly hit SCP-1843 with its horns. SCP-1843-1-26 appeared to emit a vocalization similar to "lügner", the German word for "liar." SCP-1843-1-26 was later killed by the other instances of SCP-1843-1, instead of SCP-1843-2. At time of writing, only SCP-1843-1-26 has displayed this kind of behavior. 1. More specifically, an irregular triacontahedron.